The Lia collection by Jennifer Taylor Home is the perfect addition to any living space looking to add a bit of a modern / contemporary flair. The fabric selected for the collection features Polyester blends and engineered for long life. Our wood frames are made from kiln dried birch wood which provides exceptional support and stability. Crafted beautifully with a tight back and flared arms this 3-seater sofa brings class and lounging comfort to any room in the home. We offer a unique versatility in design and make use of a variety of trend inspired color palettes and textures to bring new life to any home. The Lia collection by Jennifer Taylor Home is the perfect addition to any living space looking to add a bit of a modern or contemporary flair. This exquisite design is built with wood frames made from kiln dried birch wood which provides exceptional support and stability. Crafted beautifully with a tight back and flared arms, this 3-seater sofa brings class and lounging comfort to any room in the home. Comes in a variety of six different colors to choose from. 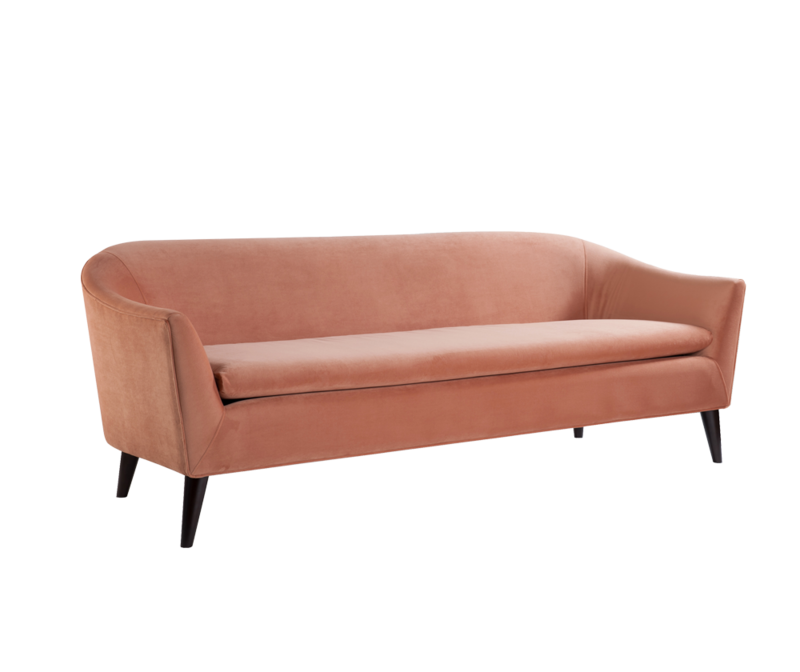 More of an apricot color, but LOVE this sofa. I was afraid it was going to be too low, but was exactly the height I needed. In spite of it's small frame, it's constructed well and feels sturdy. If you've ever heard the expression "if you want the best seat in the house you will have to move the cat", this must be the best seat. They never sat on my old one but have taken over this one. I love the lines, so simple and elegant. The fabric is soft and the color matched the sample I got so no surprises there. It isn't the highest grade fabric but seems durable. I'm very pleased with the upholstery job and my purchase overall. So far it’s great. I’ve had it for a week and it’s the perfect size/shape I wanted and easy to clean. 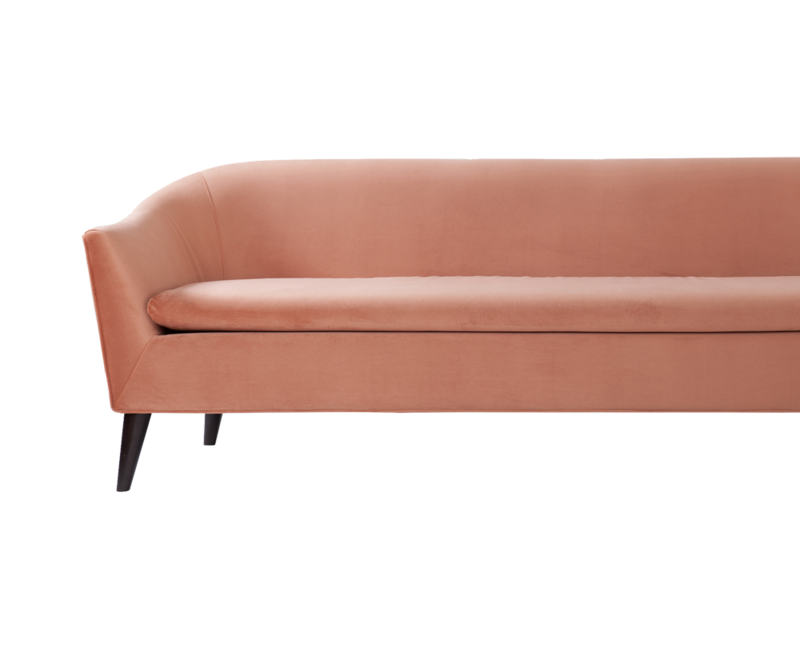 If you love a sleek clean look, this is the sofa for you. I appreciate the softness of the ivory fabric. Seats three people comfortably. Very cute, love the color, and most importantly, my cats don't even try to scratch the microfiber! (Unlike my previous couch which needed to be replaced because they immediately ruined it.) It's not as comfortable as I'd ideally like for my living room, but it's definitely worth it based on that alone. Gorgeous sofa! Looks great in my living room, very chic! Really lovely and low profile sofa. The back is shallow but the sleek look is spot on. Will look killer in our mid-century modern meets Moroccan home. The color is just like the photos online: a blushing apricot shade. Beautiful sofa with sleek, clean lines and rather comfortable too. However, the cushion does not lay flat and there is a slight ripple which then causes gaps.